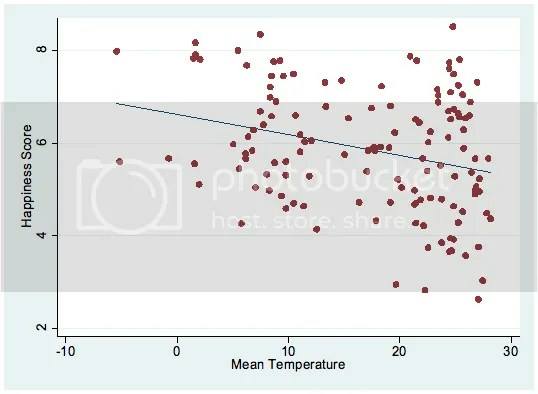 At the time I speculated that temperature appeared to be positively correlated with national happiness – better weather, happier people. However, I didn’t look further into this idea at the time. Let’s take a closer look. Graphic by author, based on Tyndall Centre for Climate Research data. 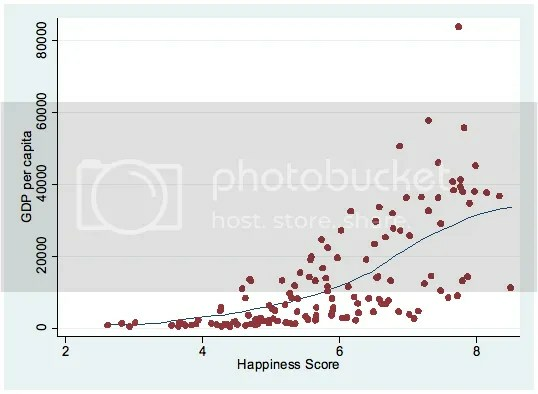 Happiness scored on a scale from 1 to 10, with 10 highest reported well-being. Graphic by author, based on World Bank 2009 PPP income data. Graphic by author, based on World Bank 2009 PPP income and Tyndall Centre for Climate Research data. 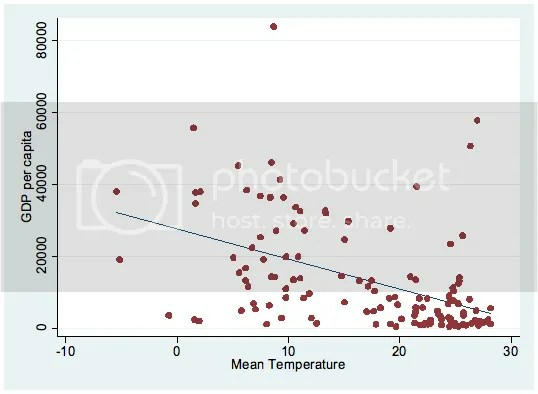 Correcting for colder countries’ higher average income, the relationship between mean temperature and national happiness largely disappears. However, the strong relationship between geographic factors like mean temperature and national income is mostly under-appreciated in public discussion, though it’s been extensively explored in academic literature. This effect is likely due to numerous factors: tropical countries are home to more infectious diseases, which severely retard economic development and the emergence of stable societies; natural disasters like strong storms, floods, and droughts are more common in the tropics; and common cash crops are generally more suited to hot climates, encouraging warm countries to adopt unsustainable export-focused cash crop economies. Additionally, the sheer size of the globe placed warm countries at a further disadvantage: the distance between equatorial warm countries and richer ones at northern latitudes placed them at an economic disadvantage by removing them from developed world markets, a hindrance even more important before the development of inexpensive transportation technologies. The main lesson here is that while national happiness is hugely influenced by public policy choices, it’s also determined by geographic factors policymakers have little influence over. This is important because national happiness, rather than income, is the developmental metric we should focus on maximizing. While rising consumption is an important factor in raising reported well-being it isn’t everything, and ultimately a just society is a happy one. 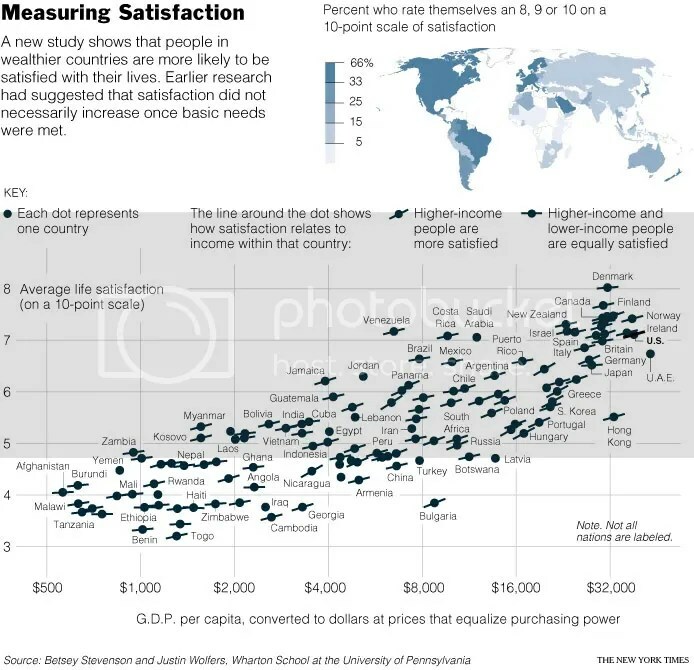 As the world becomes richer it’s important to remember that some countries will always be at a geographic disadvantage, and these disadvantages affect happiness as well as more obvious measures like income.